We have an instructor trainer / certifier in house and therefor we can train you up to instructor. We have the experience you may require, we have done +5000 new divers in the past. We have the knowledge of all needed and right diving equipment due to our side job which is being TUSA sales representant for Spain. Please read the details of all diving courses below. Open Water Divers is the diver training which results in having a worldwide certification for diving up to 18 meters of depth. This is the first step of the rest of tour active diving life. 4 theory sessions. 4 confined dives and 4 open water dives ( 2 from the boat ) and all included – 475,00 p.p. SSI stress and rescue course, this will make you a responsible and safer buddy. Besides experience to will really learn a lot in this course. 2 theory sessions, 2 conined sessions and 3 dives in open water ( from the boat ) including scenario’s. price is € 325,00 and is all included. Before getting the card you must prove abbility in first aid and CPR. SSI Deep diver, going further and deeper is one of the most prestigious specialty’s. 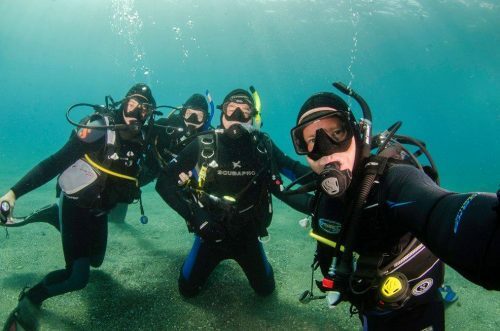 join us on the bomber and the wrecks of the Mediterrenean and GO DEEP, 2 theory sessions and 3 dives from the boat will make you a DEEP diver – € 259,00 p.p. We have a variety of specialty’s such as Nitrox, Boat, Navigation, Drysuit, Perfect Buoyancy etc. price per specialty is for theory and boatdives ( 2 ) all equipment included – € 169,00 each p.p. Become a SSI divemaster in 1 week. Theory, confined water and open water sessions ( more then you please ) For € 695,00 p.p. you are the entry level dive professional. As only divecenter in the region we will provide Technical training TXR. Deeper, longer and further then recreative divers. For this training it is required to have your own diving equipment, We do have the twintanks and stagetanks for you. Training will be 4-5 days. – € 750,00 p.p.